March 19, 2015 by Ethan Paulson	in Interact Case Studies, lead generation, market research. In this article we’re going to be walking through how to successfully make a quiz for a client through our quiz platform. This will be a wide discussion from start to finish, processes I’ve experienced, and how to curate the content and design to fit perfectly with the brand you are working with. Overall the process is not complicated and you should be able to follow along quite nicely and this can even be a good overview to look at before you get moving by yourself on creating a quiz. Before we get going, below is the quiz that we’ll be completing today, why don’t you take it and then we’ll get into it! I’ll set the premise and some goals before I get going. 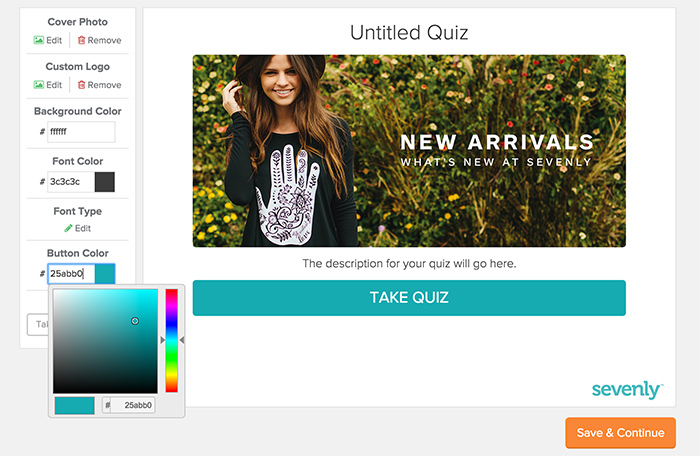 For example today, we’ll be working with a clothing company called Sevenly who want to make a personality quiz. Their goal is to match potential buyers visiting their website to a product they have to offer. 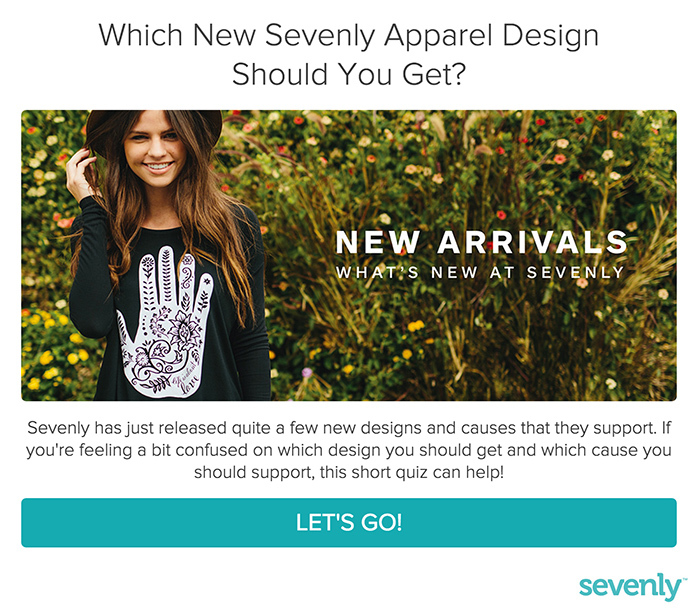 Based on their answers, Sevenly wants the quiz to match up users with an article of clothing and even specific designs within that these articles. If you aren’t familiar with Sevenly, they are a clothing company that donates $7 of every purchase to certain charities that rotate. They stand for good causes, but to be honest I just love them because their shirts are designed so well. 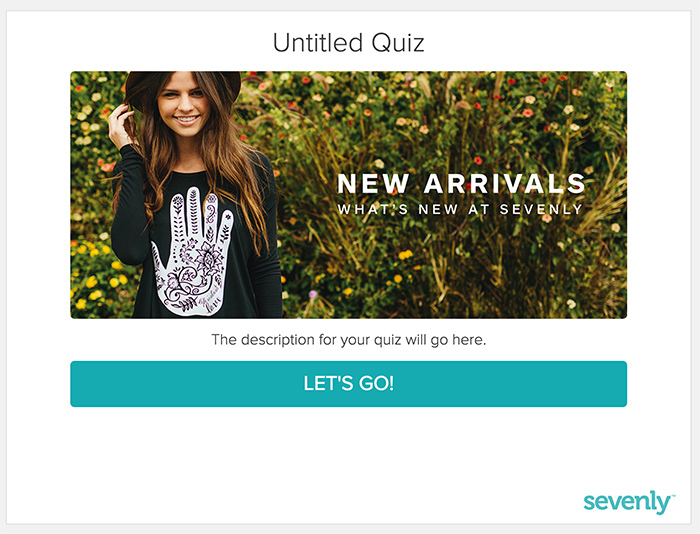 Sevenly is going to be my example company today that I’m building a quiz for. 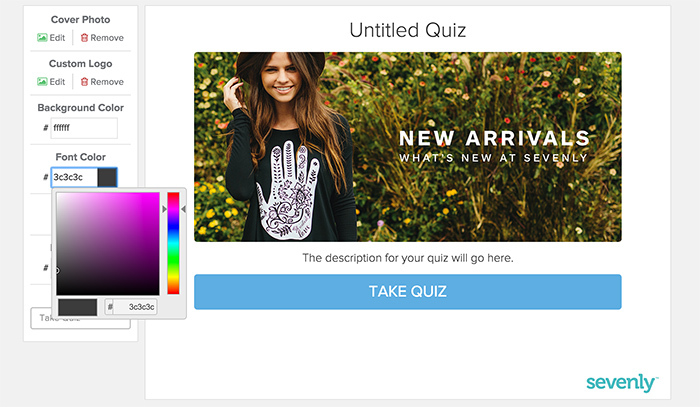 Sevenly also has a specific brand and company colors that they want the quiz to match so it looks well positioned in their website. 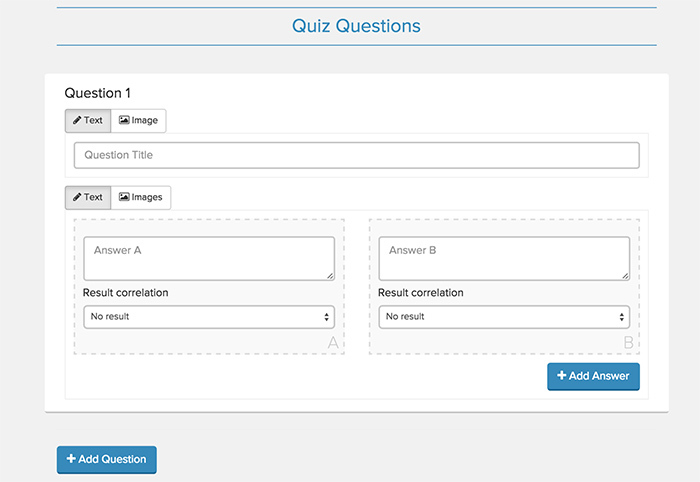 Our goal is to make them a quiz that can easily be implemented in their website, and help them with content and images so we can make an overall good looking quiz with a high completion rate. All of these aspects along with title and tagline will tie in to how successful this quiz will be, so let’s discuss all of that and a typical process for making a quiz like this. 3. How many Questions? What will they be? These 8 points give us a good outline of what we’ll need to be doing working with this client. So let’s get cracking! So one of the first things we need to do is figure out how this quiz is going to look. Here is the visual identity of Sevenly’s brand, and we need the quiz to match this. Below is the logo and color scheme that Sevenly has, so it’s what we need to follow. 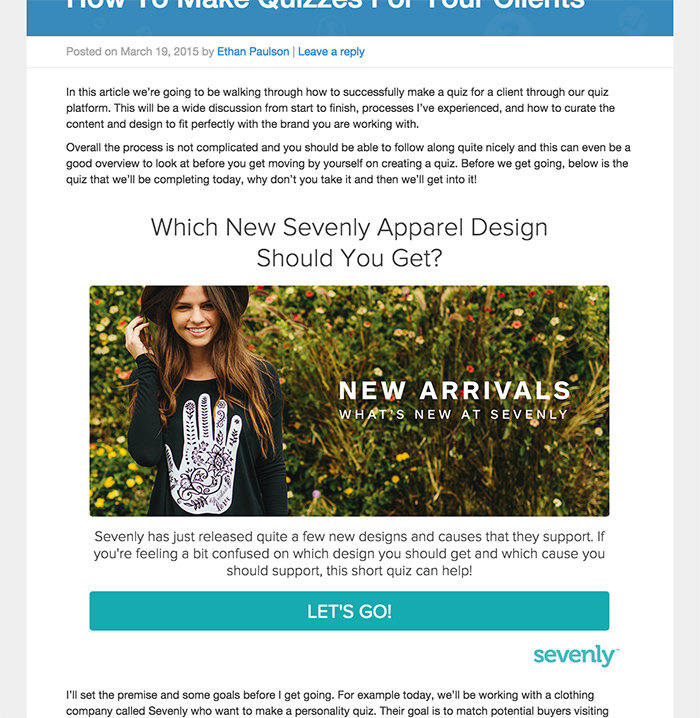 Sevenly boasts a light blue to almost teal-ish brand, which you see across a lot of their work. We’ll definitely want to keep this mind as we design the quiz. They have a mixture of typefaces that they use, from simple san-serifs to more slab-serif title text. Before designing a quiz these are all things we want to make sure we’re aware of so we can set up the design properly. Once we’re signed into Interact, we’ll go ahead and click on create a new quiz. 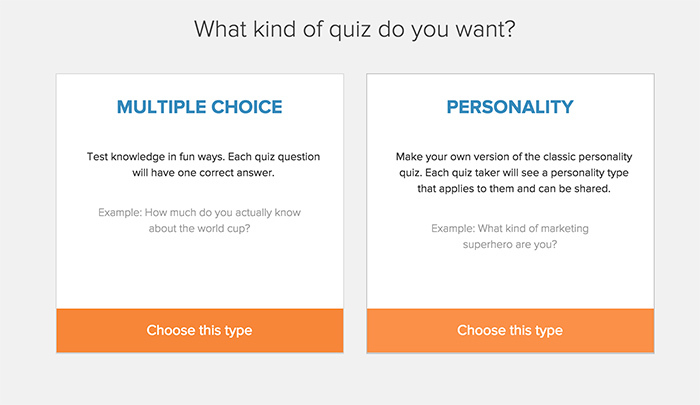 When it prompts us to choose what type of quiz we’ll be making, we’ll choose personality quiz. This is because we are making a quiz that doesn’t have wrong answers, just different responses that lead to a result. Once we click on that, we’ll be working with a blank slate. 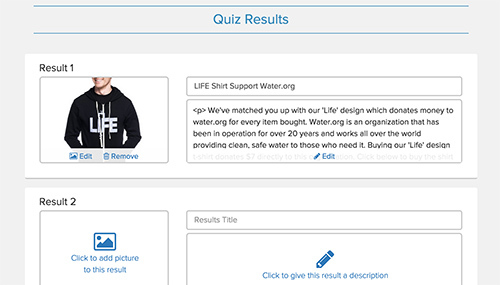 A few things we might want to change on this quiz that you see options for are the cover image, font, font color, button color and text, and the logo. First, let’s change the cover photo. We want this photo to represent the products of the company as a whole, and most likely we would be able to receive an image from them that would look best on the front cover. I always recommend trying to get some faces in there, as we have learned that conversion rates tend to improve when there are faces on a quiz. 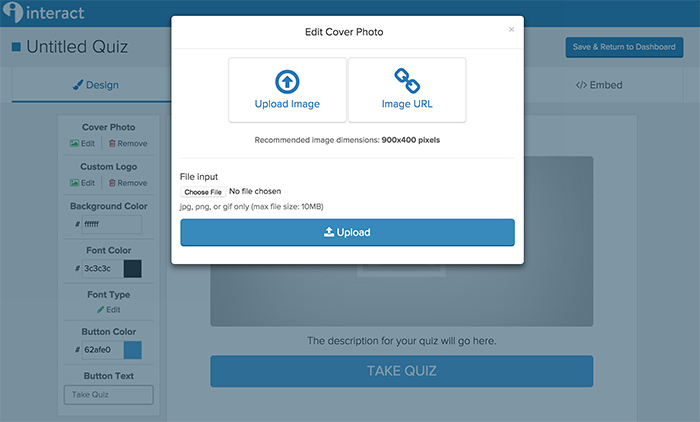 To upload our photo, we’ll click on ‘Cover Photo’ in the top left corner and select edit to put our cover photo in the quiz. We recommend the photo to be 900px by 400px. Once we upload our photo, we can see what it looks like on the quiz. Looks good! Now that we have that done, let’s keep going down the line. Next we want to replace the logo. 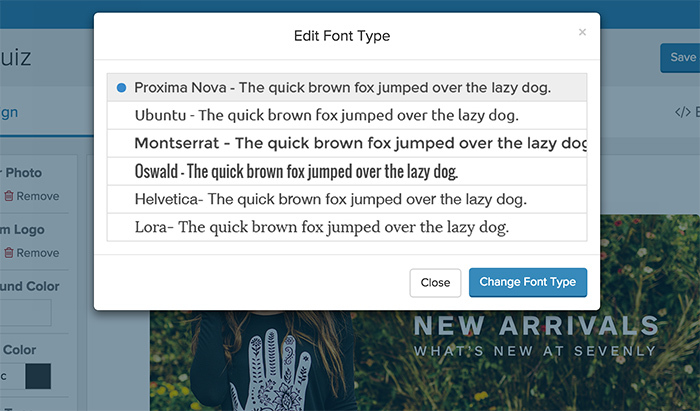 Click on the edit button in the ‘Custom Logo’ section in the top left, and let’s upload the Sevenly logo with the blue typeface, which will look best on white. 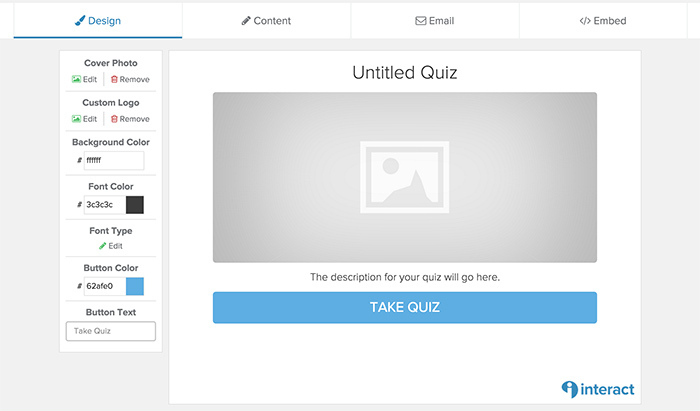 Since the background of our quiz is white, that looks great sitting there in the bottom right corner. The background we’re going to keep white for this quiz, so we’ll leave that option alone. Up next is the font color. Now this one is interesting because we really don’t want to mess too much with the font color, because if it’s anything but a darker grey or black it’s not going to look good unless the brand specifically calls for it. This brand uses a light blue, so we can’t use that as the font color. Let’s go ahead and just keep it at the default, which is a dark grey. For font type, I also like the default best here as Sevenly works with a sans-serif and modern brand, so Proxima makes sense as for what we would want to go for. Up next, the button color and text on top of it is a great way that we can not only personalize the main color block to our brand, but also use the text to entice users to take the quiz. Let’s make the button color match our light blue to teal brand that is exemplified in the logo. Well now that all the editing is done, here is what our quiz looks like! Looking good. 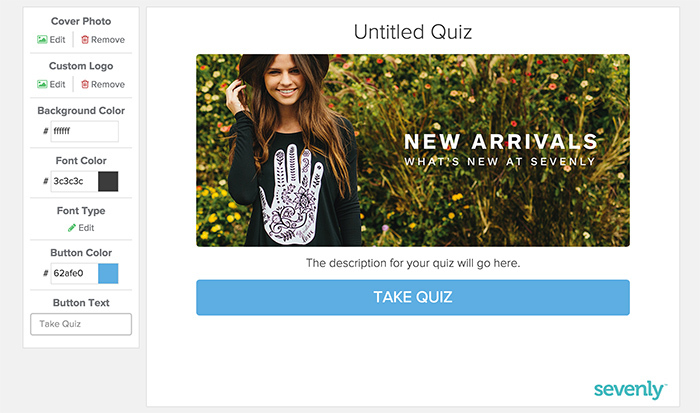 We have a quiz that matches the brand and will fit well with the website. Since we’re done here, let’s hit ‘Save & Continue’ and move on to point number two. If you want to make a quiz similar to the one we’re making or at least follow along with your own examples, head to tryinteract.com and walk through the process with me! First things first, after we save and continue from the design portion of the quiz, we need to title our quiz and put a description in. As for the title, I decided to make it pretty simple and straightforward into what the quiz is about, choosing ‘Which New Sevenly Apparel Design Should You Get?’ This pretty much calls the quiz what it is, and poses the direct question that the quiz answers. 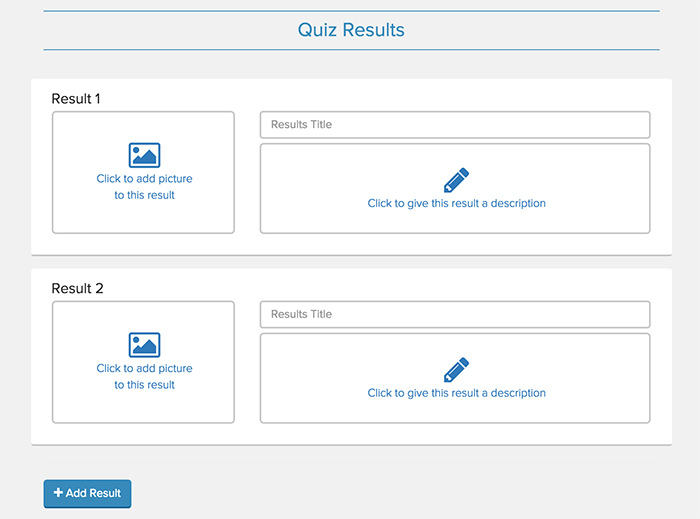 Before we get going on the actual questions of our quiz, we want to write up the answers that our users will be getting. For this quiz, let’s go ahead and just make two different types of answers. Based on the way they answer the questions, they can get one of two results. The first is a t-shirt design of a new product line that donates to the cause of the week, while the second is another t-shirt dedicated to giving to water.org. Here they are below. The first thing we want to do is make an association with who would be buying each product. We’ll dig into this a bit more when we actually craft the questions, but we need to come up with descriptions of each result and then craft questions with answers that can naturally feed into that result. Let’s make our result and description for each of those products. 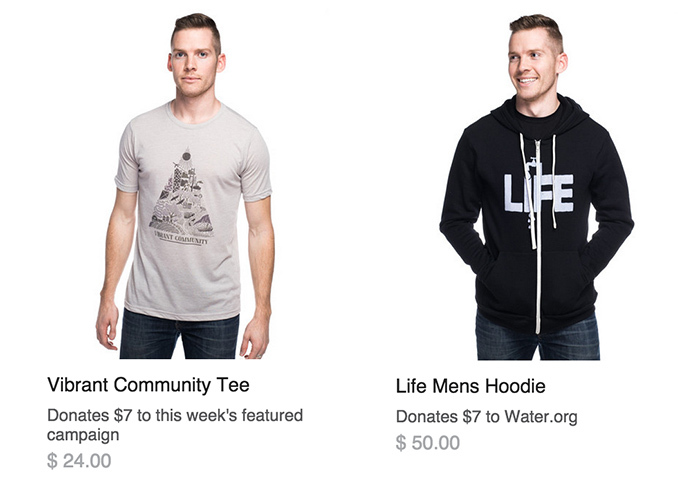 First is the result that points toward the shirt that has the simple message of ‘Life’ on it and donates to water.org. Water.org works all over the world but has major operations throughout Southeast Asia and Africa, as well as some in South America. If someone has a desire to help these regions specifically, they might be compelled to donate towards this cause. There are other factors here including different designs that may affect the decision, but these are all things to take into account. To add a description to our first answer, click on ‘Click to give this result a description’. It is always good practice to provide direct links to the product and the organization so that the user can immediately be sent to the right area of the site after the quiz. We also want to add a photo of the design, so I uploaded a photo of the hoodie to be displayed when they get the result. This can easily be done by clicking ‘click to add picture to this result’. For our second result, we have a more general design that caters to the cause of the week. This is the vibrant community tee which overall promotes general awareness of causes listed on the site, and donates to the rotating causes that are listed on the site. This is a bit more complex of a design, which might please others over the simplicity of the life design. As you scroll down, first let’s talk about the length of the questions and amount of answers before we get into content. We’re making the goal of this quiz to be short and sweet; we’re going for a high completion rate and simple questions to answer. With just two results, I think it’s safe to go ahead and just go with two responses to each question, each one correlating to a single result. As for the total length of the quiz, let’s go with 5 questions. This way no matter what at least one result will win by majority, and it’s short and sweet. 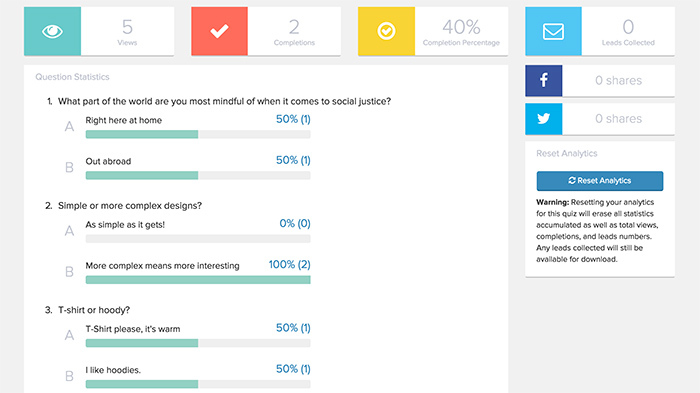 It should take users less than 30 seconds to take the quiz, which is a great target for a short quiz like this. Now we want to keep in mind a couple of different things when we’re making questions. Since our t-shirt company also gives $7 of each purchase to a charity associated with the shirt, this could also sway which design a user would choose. Along with that, we have the designs themselves, but this quiz is attempting to place a user with a product based on some personality questions. Our questions can be incredibly direct, or a bit more obscure. Here are five questions below that I’ve come up with. 1. What part of the world are you most mindful of when it comes to social justice? 2. Simple or more complex designs? 4. Would you rather travel to help humanitarian causes or get involved at home? 5. Which cause do you feel you should be more a part of? Pro Tip: Looking for quiz questions to use on your quiz? Check out our list of quiz questions you can use. So now that we have the questions, let’s talk through each one. 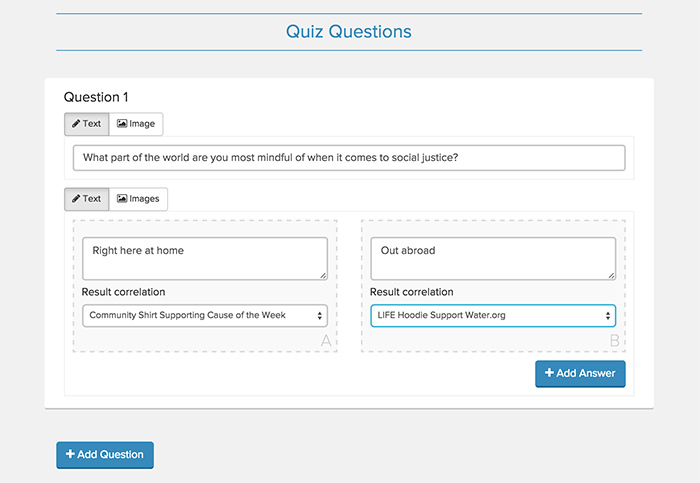 Question 1 asks ‘What part of the world are you most mindful of when it comes to social justice?’ This question is geared to gain a result of whether they care more about issues here at home or out abroad. 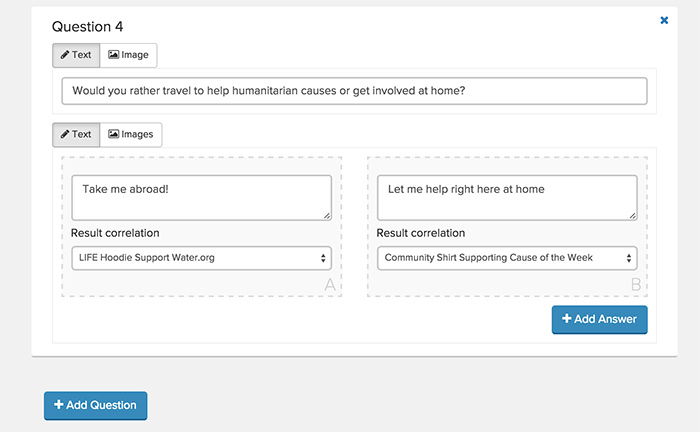 Our answers for this question are ‘Right here at home’ or ‘Out abroad.’ Basically this points us towards water.org if they’re more aimed towards issues around the world, and towards the community tee option if they are more concerned with domestic issues. Right below each response there is an area to choose which result that answer complies with, so select the proper result beneath each response. Also, we do want these quizzes to be modeled after a conversation, so instead of making our answers simple, make them seem like more of a response you would get if you we were actually in a conversation with someone. Instead of here or there, for this question I chose to use the more conversation friendly answers you see above. The second question simple asks if the user would want simple or more complex designs. There isn’t too much to talk about with this one, and it entails a simple answer ‘simple’ or ‘complex.’ Simple refers to the Life design, while complex associates with the community tee. 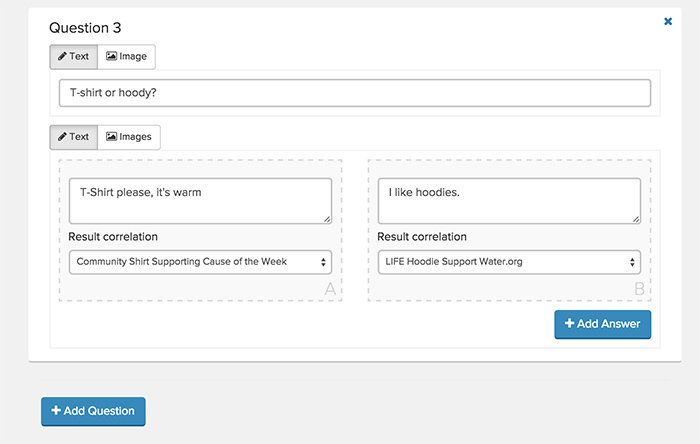 ‘T-shirt or hoody?’ This is another simple question with a simple answer. I probably don’t need to dive into this one too much either. Our question here is ‘Would you rather travel to help humanitarian causes or get involved at home?’ This again caters to whether our quiz taking audience would rather get involved with domestic issues or foreign issues. Our answers for this are going to be ‘Take me abroad!’ to refer to the water.org result, and ‘Let me help right here at home’ for our community result. Our final fifth question asks directly which cause they would be more interested in being involved with. This question is asked to perhaps tip one result over another, and solidify which product they’re going to get. Our answers will be ‘Providing a clean source of water for those who don’t have it’ and ‘Helping the homelessness issue in my hometown.’ You can probably figure out which result each of these correlates with. Now that we actually have our quiz built, go ahead and take it below to see what it looks like live. Alright so now that we have our questions and answers built, how do our results line up? I know we made the responses before we crafted out the questions, so do we need to go back in and tweak anything? For our quizzes sake and being made with this article mind, I think it’s safe to say that we’re fine and the quiz makes sense. I added this question in here because often times when I’m building quiz I have to go in and change the wording or edit some of the questions or responses to create a better flow for the quiz. If you feel satisfied with the content of your quiz, we can move on to the next step. So here is where you can find some extra value in your quizzes. I’m going to propose the idea of adding an email collection to the end of the quiz, and talk about why below. I feel there are tons of benefits to adding this to the end of a quiz, and it can really add value to your quiz as a whole. Lead collection is something that is very popular amongst websites today. But with every popular idea to gain customers, there always comes the difficulty of actually making it happen. What we have here is an easy way to collect leads, and we can even create incentives around the prospect of giving up your email to see your result. 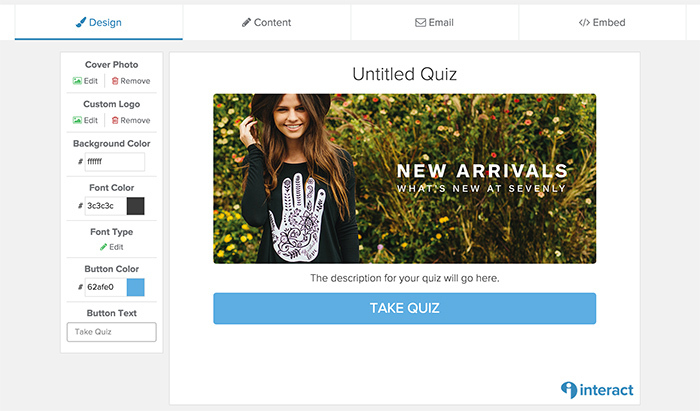 When you collect leads through your quizzes with Interact, there is always the ability to have a skip option if your users decide not to give their email. 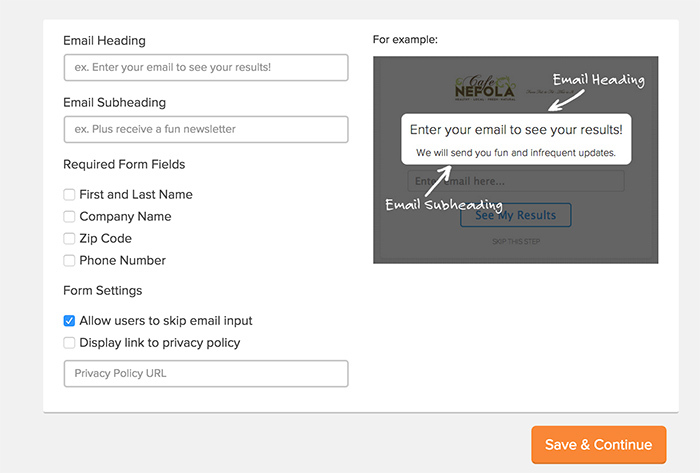 This takes away the worry that users won’t complete their quiz if they have to give up their email. We normally see about 50% of users who take the quizzes complete them and give their email, so that is a pretty incredible conversion rate. If you’re able to get 100 people to complete a short and easy quiz, that’s at least 50 new emails you get to add to your email list, which is awesome. 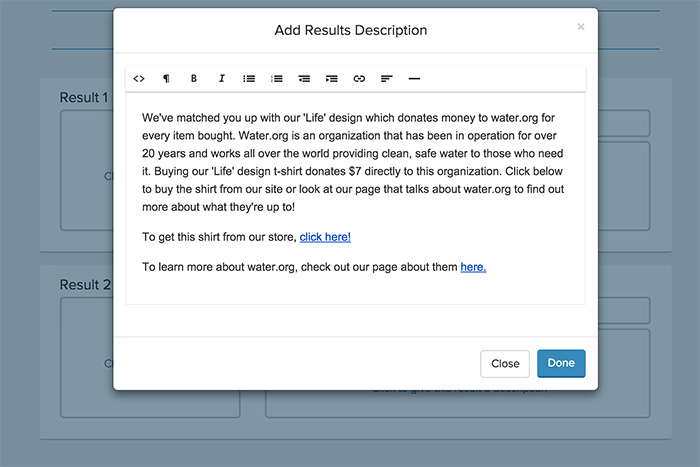 To create lead collection, first you have to tell Interact that collecting emails is something you’d want to do. Simply click ‘Yes’ when you move on from the questions area. 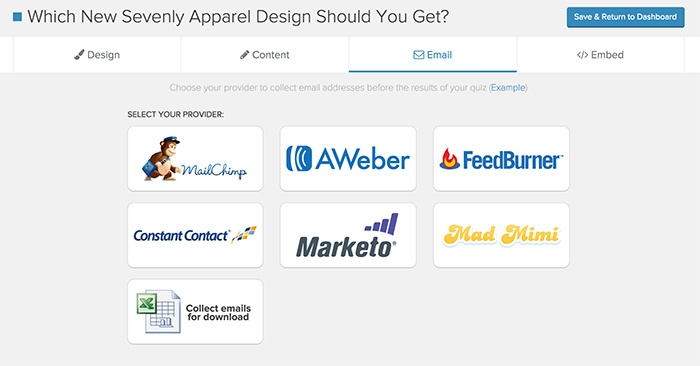 Once you click through that, you’ll see the many options we have to collect to your email list provider. 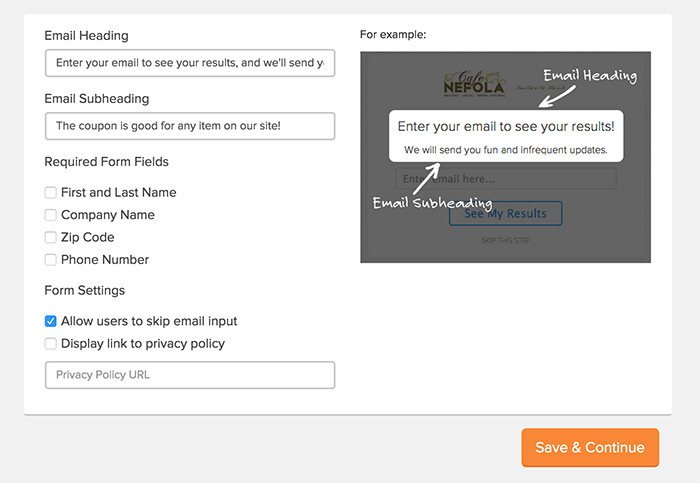 After clicking on way, follow the steps to connect your email list to your quiz. Now after we do that, we’ll need to fill out what our call to action page is actually going to look like. Below are the blank call options we provide that you can fill out. A strategy that I think is great is the idea of giving an incentive for people to give up their email. 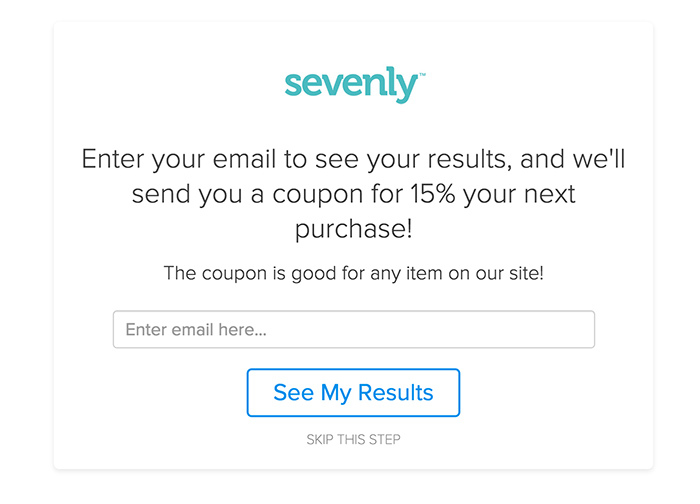 We’ve had customers that have done something as simple as telling the user they will get a coupon for 10-20% off their purchase, and this dramatically increases the amount of people that are willing to give up their email, especially if they’re looking to buy the product. It’s a small cost to you as a company, and it allows you start a virtual relationship with more people. Through this you’ll have more customers buying your product, and they might even buy more in the future. I always recommend putting in an email capture at the end of a quiz, as it doesn’t deter users from finishing and can give you valuable leads. Interact hooks into a lot of major email collection services so your emails can go straight onto your list automatically, or their also just straight up downloadable from the site. Let’s talk about the seamless quiz experience for a second to wrap up the article. Now we do want to be smart on where we place our quiz inside our website, as we want to optimize user flow and how it matches the environment we’re in. Look above to where I implemented the quiz into this article. The white background blends right in with the article, there aren’t borders or anything like that, and the quiz is seamlessly implemented along with reading the article. It truly is a part of its background. This is something you should always strive for when placing the quiz. You want it to not stick out in its environment, but just be present within it. This ensures that the user flow isn’t interrupted, and that is what we’re going for. I normally recommend sitting the quiz within a page, but there is always the option of having the quiz standalone in its own page. This makes the quiz the only experience happening on the page, and then you can go ahead and link out of that page through the results to where the user might want to go. This might come in handy by linking to a standalone page off an email, where you might be able to get more insight into who is clicking out of the email to get to the quiz. You can also see exactly how the quiz is performing because there is nothing else to do on the page. Placing a quiz this way has its benefits in this regard. Another great thing we get through our quizzes is plenty of data. You can see who answers each question in certain ways, which result gets the most hits, and how many emails you have collected based on completions and views. This data can be very valuable and tell you a lot about the users that are taking the quiz. To put this inside a scenario, let’s say we’re seeing a large amount of quiz takers leaning towards water.org as their result. This might cause us to cater our products to more foreign causes because we see that our users are more interested in that. 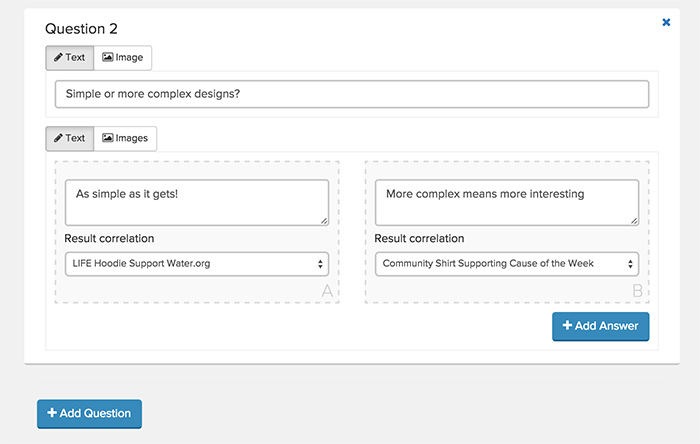 We might even want to extend the feature of water.org as a partner of ours, since it seems to be popular with our users. If you use the quiz with enough hits from your user base you can learn things like this, which might cause you to understand characteristics or trends you didn’t know about your users before. This can also be some pretty valuable data. To wrap all of this up, hopefully now you have a good indication of how quizzes can be used effectively as a marketing tool to point your users to more sales and establish relationships through email collection. The goal of this article was to provide a thorough case study and example that you could easily tweak to make a quick quiz that caters to the audience of your website. We’ve seen some pretty incredible results of companies getting tens of thousands of leads by using quizzes, and we honestly believe that any company can create the right content for their quizzes and see major success in adding emails to their newsletter lists. If you’re running any sort of start up, you know that gaining users attentions is one of the biggest factors into making them a customer.